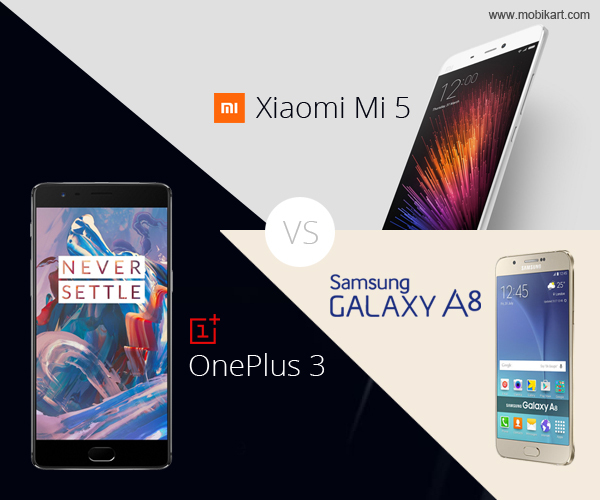 You are at:Blog»Android»Xiaomi Mi 5 vs OnePlus 3 vs Samsung Galaxy A8 – The Best Bang for Your Buck? It’s the battle for Budget! 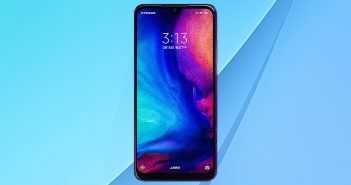 Who wouldn’t love to own a Smartphone that offer most of the features without burning your pocket? However, with more choices, comes the difficult task of choosing your next purchase. So, if you are planning to buy a Smartphone and are confused between these options, the blog is here to rescue. Read on as we dissect all these Smartphones on various aspects to find out which one best suit your requirement. The first step to making a premium Smartphone is making it look and feel like a luxury product. All the phones chosen for comparison are attention grabbers. Xiaomi Mi 5 and OnePlus 3 mobiles have a sporty metallic body. Mi 5 feels suitably premium, and does not let its mid-range pricing affect that in any way. While OnePlus has shredded its unique sandstone finish image and has now joined the all-metal club with its aluminum unibody with dual curves at the rear. It’s available in graphite colour, with the gold version slated to launch later. Samsung Galaxy A8, on the other hand has the plastic back with a nice finish, looking somewhat metallic from a distance. The matte texture & the metallic edges contribute to the Galaxy A8’s premium feel thus featuring a distinct design language. Samsung variants have deep Blacks while hues are vibrant and full of life. Xiaomi Mi 5 is extremely light at 129g. The screen of the Xiaomi Mi 5 is a 5.15-inch full-HD IPS LCD affair, with an impressive pixel density of 428 pixels-per-inch, and Corning Gorilla Glass 4 protections. It’s also an incredibly bright IPS screen, with a peak brightness rating of 600 nits and a minimum brightness of 0.7nits. Xiaomi Mi 5 is a dual SIM phone that offers a Snapdragon 820 SoC, a USB Type-C port, 4G LTE with VoLTE, NFC, a 16MP rear snapper and a 4-UltraPixel front shooter. As far as the cameras are concerned, the Xiaomi Mi 5 packs a 16-megapixel primary camera on the rear and a 4-megapixel front shooter for selfies. Powering the 5.5-inch display is Qualcomm’s Snapdragon 820 processor, OnePlus 3 offers superior multitasking. The new Smartphone runs OxygenOS on top of Android Marshmallow. It’s a quad-core chip clocked slightly higher at 2.2 and 1.6GHz with an Adreno 530 GPU. The fingerprint scanner is still a key feature. There’s also 4G LTE (Cat 6), 11ac Wi-Fi and Bluetooth 4.2. Although there’s no expandable storage, the OnePlus 3 feature a dual Nano-SIM setup. It offers reversible USB Type-C port and now supports fast charging of over 60 percent in 30 minutes. 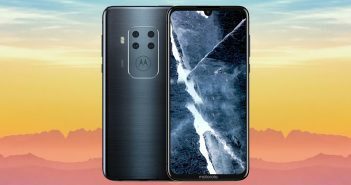 The rear camera is packed with 16-megapixels, and the front camera has 8-megapixels featuring optical-image stabilization as well as electronic image stabilization to reduce blur. The Samsung Galaxy A8 runs on Android 5.1.1. 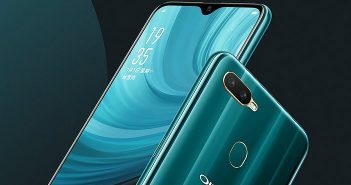 Although Samsung has used the Qualcomm Snapdragon 615 SoC in global variants of the Galaxy A8, the Indian version uses the Korean company’s own octa-core Exynos 5430 SoC., a 16-megapixel primary camera and a 5-megapixel secondary camera. The A8 is a dual-SIM device with both SIM slots supporting 4G SIM cards and weighs about weighs 151g. Galaxy A8 supports 16-megapixel rear camera and 5-megapixel front camera. It also uses a slimmer ISOCELL LSI3P3 camera sensor to fit into its 5.9mm frame. Sharpness, detail and colour reproduction are definite strong points. Samsung Galaxy A8 offers 32GB of internal storage (expandable by up to 128GB using a microSD card), 2GB of RAM, whereas Xiaomi Mi5 comes with 32GB memory / 4GB RAM. One Plus 3 would certainly pique your interest as it’s available in multiple configurations, and offers a whopping 64GB of storage space with 6GB RAM. Samsung Galaxy A8 is powered by a 3,050mAh battery while OnePlus 3 and Xiaomi Mi 5 draw juice from slightly smaller 3 0,000 mAh units. At the end, it is hard to define the battery life without the real-life usage. You can find Samsung Galaxy A8 priced at Rs 25,430 and Xiaomi Mi5 at Rs. 24,999 which available across all online stores. One Plus 3 is available exclusively via Amazon at Rs. 27,999. If you’re looking at the spec-to-price ratio, then Xiaomi Mi 5 seems to be the best option out of these three. It offers the good display, better storage and doesn’t skimp on other aspects either. Further, the content ecosystem of Mi5 is an icing on the cake. However, if you’re looking for ergonomic comfort, then the Samsung Galaxy A8 has slightly less RAM, yet impressive design language and add to it the fact that it’s the next affordable phone among the trio. OnePlus 3 can be worth purchasing looking at the whooping memory and storage. It’s enticing design and loaded camera specs do make it seem like an option worth investing for. However, budget wise at Rs. 24,999, the Xiaomi Mi 5 is a fantastic smartphone that grabs the battle for the price and worth. If you do manage to pick one up in the flash sales, it won’t let you down.